I realise there are a lot of teleporters out there, when I started making this one it was because I wanted a specific design for my own use, and a user friendly menu system that allowed for long, descriptive destination names. I also wanted a teleport experience that actually felt like you were being teleported somewhere! I paid special attention to the audio and visual effects in my attempt to achieve this. When you use a SIMport teleporter you find yourself inside the beam. The hazy glow of the world around you disappears in a flash of light as you hear the pad stripping apart your molecules. A split second later as the pad reassembles your form, the light fades and your new location comes into view. Quick, simple, and relatively painless! If you like the scripting but don't like my teleporter design, the good news is the pads are modifiable, allowing you to change the look, colour, sound effects and particles to your own preference. In the box you will also find a free affiliate vendor allowing you to resell this product at 25% commision. If you wish to take advantage of this be sure to read the Affiliates notecard first! If you have any questions please contact me and I'll be glad to help! Rez a teleporter on the ground. You will be prompted to select a network number from 1 to 6. Next you will be prompted to select an access level for the teleporter, Public, Group or Owner. Edit the pad and name it as you would like it to appear in the destination list of other pads (up to 63 characters!). It's as simple as that! You're now ready to put down the next pad. Go to your next destination and follow steps 1 to 4, making sure to select the same network number as you did previously. This time after selecting the access level you should see the pad turn red for a few seconds as it connects to the other. You can have up to 25 pads on each network. Fast and simple auto-linking setup. 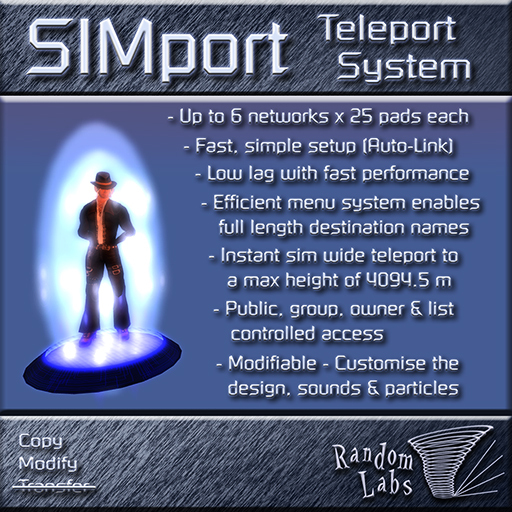 25 teleporters per network and up to 6 networks per sim, allowing 150 pads total. Public, group, owner and list controlled access (list can hold around 600 avatars). No beam hijacking - Teleport beams will only work for the user that requested them. Destination pads announce "Incoming Traveller" and ignite their plasma streams. Very low lag with each pad idling at around 0.004 to 0.006 ms.
Two beam type options – 'Advanced' uses the newer resource friendly posJump hack, and 'Standard' uses the more familiar and much used warpPos (in case the posJump bug is ever fixed). Mouse look used to enhance the effect and to avoid leaving the users camera behind during teleport. Modifiable pads - Customise the design, sounds and particles. When it comes to menu driven scripts my focus is always usability. That's why my menus will always have an 'Exit' button or a way to return to previous menus when needed. I don't think you should ever be presented with a dialog that only leaves you the 'ignore' option in the case of a misclick! Clear and concise with no blank buttons, no shortened or cut-off button names, and no buttons leading to nowhere for unauthorised users! These menu options are created as needed and have the flexibility to change for different users and situations. You can both click or stand on the pads to access the menu (just walking over or bumping into a pad will not set them off). Connected teleporters always know the other pads in the network, even if you move and rename them, so no need to scan for teleporters before the menu will appear. The destination list uses the menu text and numbered buttons to allow up to 63 viewable characters for each place name! Destinations are sorted numerically and alphabetically then listed in ascending order. You can also move more important destinations to the top by adding any symbol to the beginning of the pads name. e.g. '!Main Attraction'. For privacy, pads set to Group won't even appear in the destination list for public users. Pads set to Owner will only ever appear for you. The Options menu allows the owner to easily change all the pads settings. The options button is only visible to the owner.